Specific system knowledge is like a totally sweet Camaro in the mating game: it’s not necessary, but it doesn’t hurt either. Over time, you begin to start understanding what is needed for efficient troubleshooting to happen on a consistent basis. In my interviews with great troubleshooters, all have mentioned deep knowledge of the system they’re working on as a key weapon in their arsenal. However, I hope to show you that deep experience with a particular system is not necessary to start and guide the troubleshooting process. I believe the right strategies, coupled with the right mindset and behaviors, are equal to experiential troubleshooting skills. I’m not knocking experience, it’s a powerful tool and I want you to tap into it whenever you can. I’m just challenging the notion that it’s the only entry to effective troubleshooting. Also, I’ve seen the belief that experience is needed as an excuse to do nothing. “We don’t know anything about this machine, so let’s wait until Jim takes a look at it…,” only to have Jim arrive and have no better ideas than the strategies presented here. While specific system knowledge isn’t necessary to begin troubleshooting, it can be a huge bonus to the virtues and strategies. A big part of “specific knowledge” is being able to answer the question: “What is normal?” You may think you know what is normal, but unless you’re collecting and analyzing data about your systems on a regular basis, you don’t have a clue. Trust me. You take the cover off a machine and see something that looks out of place, or notice some strange output, or hear a weird noise, or smell something unsavory coming from a machine. The next question that will invariably pass your lips will be: “Is this normal?” This question comes up all the time, and the answer is usually “Umm…I don’t know.” While “Is it plugged in?” may be troubleshooting’s most famous question, “Is this normal?” is the one most likely to be uttered by an actual troubleshooter while on the job. Not knowing the normal operating ranges within your systems will make it difficult to determine if a particular fix has worked. If the goal of troubleshooting is getting back to normal, and you don’t know what that means, you’ll merely be hoping that you’ve solved the issue. While it might appear to be “working,” your system could be operating in an entirely new range. Your fix may just be a temporary reprieve before another catastrophic failure. So, without further ado, let’s enter the world of data collection. Gauges are all about the current state. Gauges will tell you “what’s happening now” and consequently are a great way to begin any data collection regime. 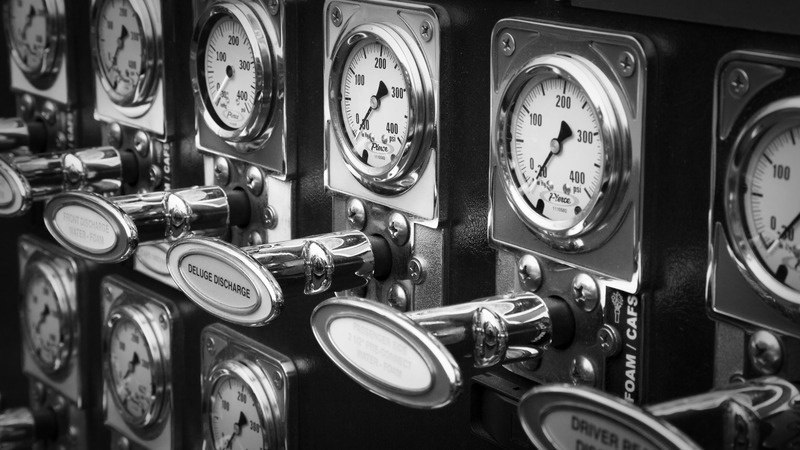 Gauges don’t have a memory and therefore don’t allow for comparison to the past, but deploying them is a good first effort. For some systems, knowing the current state may suffice if the operating parameters (i.e., the desired state) are relatively well known and unchanging. The manufacturer may have published guidelines that can be a sufficient proxy to “what is normal.” Or, “normal” may be well described in your own documentation or known among your operators. Diagram: a valve controlling flow to a network of pipes. Diagram: valve with a gauge to monitor pressure. If the gauge reads higher or lower than desired, the valve is not set properly and requires adjustment. If adjustment of the valve has no impact on the pressure reading, we can hypothesize that the valve is stuck or broken. Within this simple system, troubleshooting can now be done efficiently with just this single gauge. Knowing the current state (i.e., the pressure reading) will point the way to the problem. The problem is that many failures will start within (or near) the normal operating range, until breaking out. Again, unless you had been present at the time of the failure (in this case, it’s probably good you weren’t! ), you wouldn’t have seen the exponential rise in pressure before the explosion. During the time of your monitoring, the pressure readings were in a tight group between 101-104 psi. There was a slight uptick at noon to 104 psi, but from these data points alone it would be difficult to tell if that was a harbinger of trouble (plus we saw a reading of 104 psi at 8am). So, you arrived back from lunch to an exploded boiler…and unfortunately a gauge that now reads zero (if it can be found among the wreckage). 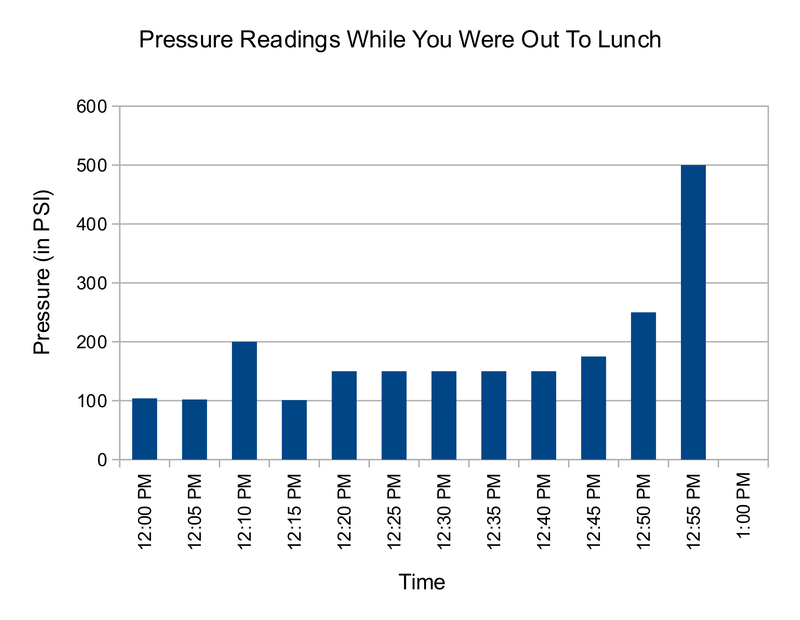 Graph: pressure readings during the noon hour. This is so much more useful than just knowing the current state! You can see the pressure building in the run up to the explosion and begin to form a theory about its cause. Here we can see a spike to 200 psi around 12:10pm and then the pressure briefly returns to a normal level. Perhaps a safety release valve kicked in and brought the pressure back down? After that, the pressure hovers around 150 psi, until going exponential. If there was a safety release valve, it clearly failed this second time around. 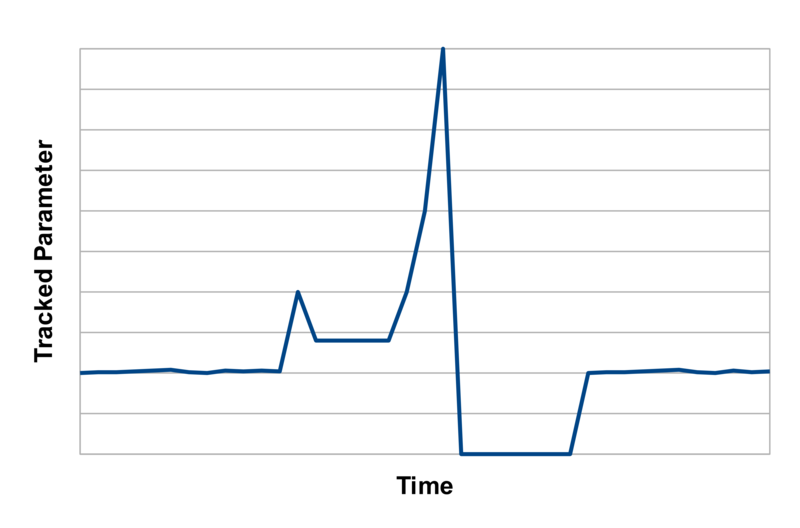 Looking at the graph, it’s easy to pinpoint the time of the explosion as occurring between 12:55pm and 1:00pm. By the way, I have seen this particular failure pattern so many times in so many different contexts. A system will be operating normally, then experience some kind of shock. After the shock, it will operate in a new, above-or-below-average range for a short period of time, before experiencing a complete meltdown. Even within this simple system, there are an infinite number of things that could be monitored. Let’s say you wish to monitor and collect data on how fast that longest belt is spinning. To do this, you’ll measure the length that the belt travels past your monitoring point within a given time period. Depending on the problems you’re trying to spot, just this parameter alone could result in an infinite number of possible data collection schemes. Perhaps the belt occasionally slips and stops moving momentarily (and you’d like to know when and how often), but that’s only something you’ll notice if you look at very small time slices (like sub-second). Different sampling rates (i.e., the period between making subsequent observations) can lead to an endless number of possible data collection schemes. You could observe how much belt passes an observation point over the course of a second, 1/10 second, 1/100 second, 1/1000 second, etc. to infinitely small time periods. Smaller time slices might not necessarily be useful, but each sampling rate would give you slightly different information. And this is just a lone belt on a simple whoozy-whatzit. 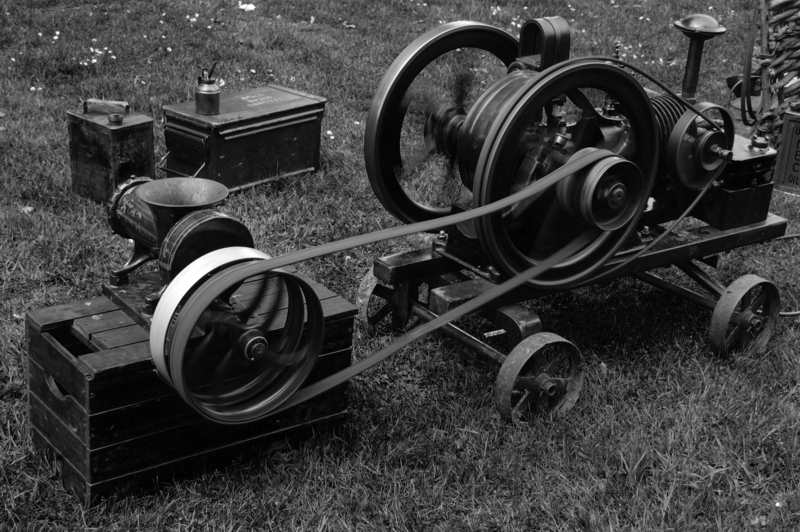 Imagine the data collection possibilities in an automobile factory or an oil refinery. Infinity times infinity! Given that the amount of data you could collect on a machine is infinite, you’re going to need to find a way to prioritize and make what you do collect manageable. One very efficient way is to let your breakdowns dictate what gets watched. Often when troubleshooting, you’ll find yourself saying “I wish I knew what was happening to this before the failure…” Those moments are great indicators of what to monitor in the future. There is little wasted effort with a scheme like this: you’re focusing on things that actually have tripped you up in the past! I think you can do yourself one better by proactively surveying your systems for things to monitor so you’ll be ready when the next crisis occurs. If you have even a passing familiarity with a system, you can usually make an educated guess about what you’d like to know about in the event of a breakdown (run through some imaginary scenarios in your head or review your recent incidents for ideas). From there, let real problems guide the additional parameters you add to your data collection regimen. Good data leads the way to the discovery of the cause. Good data shows you if a fix is actually working. Graph: a data collection victory. Notice how everything, from regular operation before the incident, to the onset of trouble, to the meltdown, to the recovery after the fix, is so visually apparent in this graph. It’s abundantly clear what “normal” was before the breakdown, and it’s just as clear that you have indeed returned to that normalcy after the repair. When this happens for the first time, expect to get a little choked up. Beautiful. During crises, you should be collecting a very specific type of data: what fixes you’ve tried and when. I’ve been called in to troubleshoot some very hectic situations and gone immediately into “let’s try this, then let’s try this, and then how about this” mode. The energy of the crisis fuels an endless stream of ideas and avenues to pursue. However, if the problem persists and you don’t find a quick fix, you may find that you begin to accidentally repeat yourself. You may catch yourself in a moment of deja vu and ask, “Didn’t we already try this?” To avoid this looping, I suggest you start a simple troubleshooting log at the beginning of any crisis. If you want to call it “My very secret and very special diary of my most precious fix-it feelings,” that’s your prerogative. Oh, and this idea isn’t only for crises: any long-term troubleshooting project benefits from such a record of happenings. The past will be murky if you weren’t keeping track of it, so orient yourself to a bright future and commit to start collecting data. Yesterday may remain shrouded in mystery, but at least you’ll have data to make comparisons for the next incident. 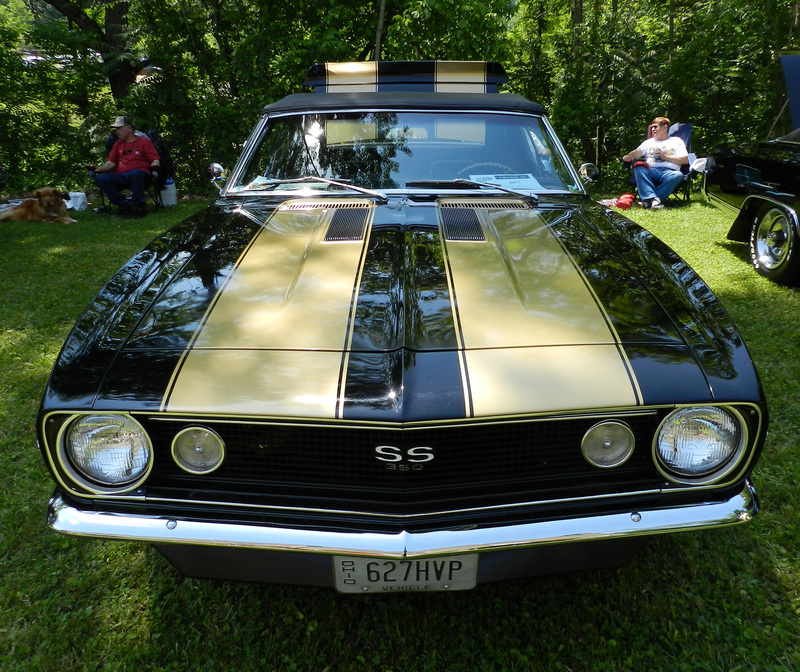 Camaros, Charts and graphs, Data Collection, Gauges, Troubleshooting, What is normal?